Of the many talks that I’ve been to, precious few are student-organized and bring exceptionally renowned speakers. 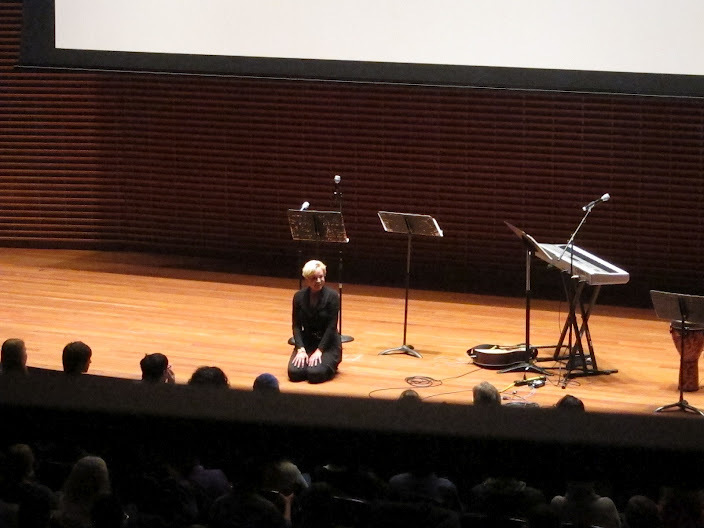 Heidi Baker’s visit to Stanford was the best yet — because of its impact on those who came. Heidi Baker shows Christlike humility in her talk at Stanford. It started with a meeting at 5pm targeted at a group of grad/professional students and academics who are really interested in stewarding their professions for the kingdom. The purpose of the meeting was to share our visions and callings with each other and with Heidi, and for her to share about needs around the world and how our training and areas of expertise might help meet these needs. I thought it would just be a nice quiet round table and prayer time. then I saw the videographers, all the cameras and lights set up, and lots of people. Wow, this is more epic than I thought! You’d think that history was in the making or something and people were here to capture it. We initially didn’t have so many people signed up, so only set up a lounge-type of circular area with comfy seating for about 12 people. Heidi’s flight was delayed so she arrived later than expected. When she arrived, people were quite excited. Though people were a little shy and we still had extra spots on the couch, so some of the not-much-older people joined us up front on the comfy seating. Finally it began. Sherol gave a brief introduction about who we were, our history, and what we were about, and passed out booklets — very fancy! 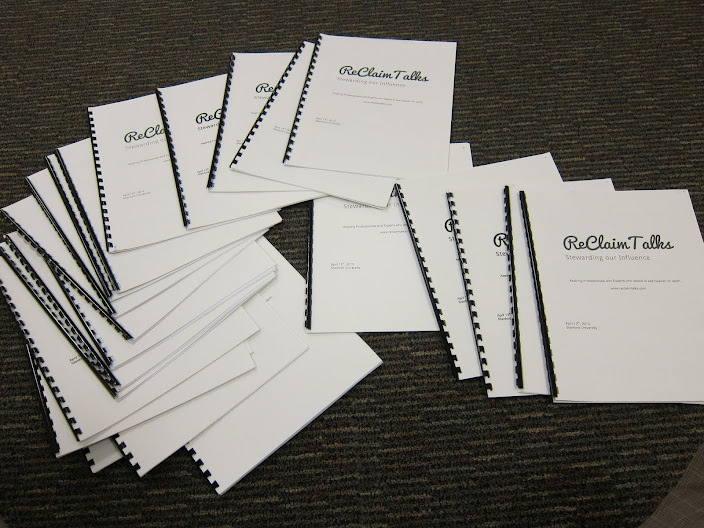 Sherol made booklets describing our history and what we’re about, and the ReClaimTalks project. Then we each talked about what our callings and passions were — our missions in life as we understood them. Honestly, the cameras made me nervous, and I found myself not looking directly at Heidi during most of my couple minutes of sharing, and not talking about my heart for atheists and agnostics, making an almost “safe” version of my calling, such as I had recently communicated to some of my agnostic coworkers. We went around in turn, each one sharing for a couple minutes. Them, Heidi shared about her background and some of the needs her org has for PhD’s and professional students. Heidi shared that there was a significant need for doctors and health professionals, as well as engineers. They are even building a university and have 5 PhD’s to be founding instructors, and need 5 more. Heidi promised that those who went to Mozambique to serve wouldn’t starve, and would have rice and beans or beans and rice depending on the day, and if they were in the bush they would have a tent, and if they were at a center they would have a bed — most likely. She led us in a time of prayer. In her prayer she mentioned how she saw Jesus standing next to the empty cross, and students coming and laying their gifts down, some laying down the deeds to their homes — this later part was the most challenging for me. I mean, I’m living in the black on a postdoc salary — the thought of earning enough money for a home and then selling it and using the money to do missions abroad — is something I’ve heard of one retired family doing, though it’s not for everyone. Still we are called to live out the good news in a way that often goes against the world. The prospect of seeing alot of my hard-earned money go down the drain in end-of-life care and medical expenses isn’t very appetizing either. After the meeting was over, Heidi hugged each one of us. I was moved to pray a blessing on Heidi for her to be continually overflowing with the Spirit of God and with God’s love, and I was surprised to feel something I didn’t expect — her humble acknowledgement of her need for God. Wow, if Heidi, who is so close to the heart of God’s love for the poor and who sees the Holy Spirit do truly amazing things every week, feels this deep need for more and more of God, how much more do I need God’s presence ? I then had the opportunity of riding in the car with Heidi to her talk. I felt it was underserved that I got this special opportunity , so I think it highly important to share what I learned. I got to ask her about how her husband Rolland (a Caltech alum!) was doing, and was glad to hear that he was doing well. I asked how I might reach out to athiests and agnostics more effectively. Surprisingly to me, her answer had nothing to do with miracles or anything like that. A brother mentioned that without faith, the miracles wouldn’t be believed anyway, reminding me of the passage where Jesus couldn’t do many miracles in a certain place (his hometown if I recall) because people didn’t have faith. Rather, her answer was to do things similar to those I had been taught to do back in college (and have been trying to do since), so it was quite encouraging. She said how even in their missions organization, about 90% of people come to church and to faith through a Christian friend. 90% ! I was surprised to find that the big events and epic ways God shows up for them are actually just a small part of how God shows people he’s real. It’s as simple — and as hard — as Jesus’s love poured on people incarnationally through His body. She promoted serving free food to people on campus going through difficult times such as midterms and finals, stopping for people, listening to them, giving them our time, and simply loving them. One thing she said that challenged me the idea of asking non-Christians what they want prayer for when they’re anxious and fearful (i.e. finals for undergrads). With the current funding crisis, academics all over the country are fearful and anxious. At the event venue, we whisked Heidi to a back room where she could have some alone time with God before her talk. She stopped however to pray with the worship team beforehand. Worship was great :). Thanks so much Chi Alphans at Stanford for leading us in worship! I saw Heidi come out from the back room and go stand in front for the last half of worship. I noticed that her face was a little reddish. She must have had an intense prayer time! Her humility and dependence on God is inspiring. This showed me that she wasn’t just treating this like another talk that so many speakers give. She must have really sought God to “show up” at the meeting and move in our hearts. For her talk, she focused on Colossians 1:1-19. She encouraged us to have “all spiritual wisdom and understanding”, and to think like God, and to seek to feel what He feels. This is difficult and daunting, for God feels very deeply about all the pain and injustice in the world. But He has endless joy as well :). An example of thinking how God thinks. She sees natural disasters and the like not as causes for bitterness against God, but as opportunities to serve people and share with them God’s love in the midst of crisis. There is a whole side of Iris ministries, her missions org, devoted to specifically going into disaster areas and other dark places and sharing God’s love. Heidi said it matters what you attribute to God, the enemy, and natural cause. Famine is an opportunity to love more and see God do amazing things. She doesn’t see famine as a time to get angry with God. God uses little people like us to be His hands and feet and to love people. He wants to break our heart open and let us feel what he feels, think what he thinks. […] If we see what he sees, we’ll start doing what he does. … and the we’ll find out all things are possible for those who believe, just as Jesus said. She also encouraged us to “discover the spiritual quotient” — not sure what that means, but I think it relates to being fully filled with the Holy Spirit and soaking in enough of God to feed many many people with His presence through us. She mentioned that our sight was limited, that we have spiritual cataracts — not sure what these are, but perhaps these are related to our vision being too small? Heidi is connected to him, in love with Him, and is “Daddy’s child”. Heidi shared a story with how she would ride on her father’s feet as a kid. God told Heidi she can do anything….it’s all Him, but He chooses to let us ride on his feet. Thanks to Sherol for providing the photos :).